I found out there’s a bus to Boston that leaves from Chinatown every hour and only costs $35 round trip!! (I’m the last to know.) I was going to go yesterday, but then I decided it would make a fun birthday thing to do so I’m going next month. 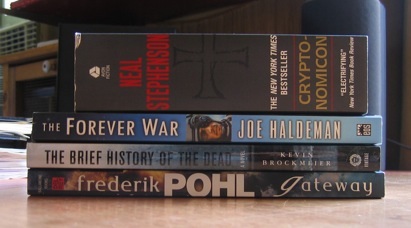 But I bought these books Thursday night, when I still thought I might go yesterday. Three were from an NPR list of great science fiction books, and one, The Brief History of the Dead, was from another NPR list by the same person, but I forget the theme. But any book that imagines what it’s like to be dead is for me! I believe that Greyhound has also begun a low-cost bus operation, i.e., first come first served, etc. Thanks! But I made a reservation on the Fung Wah one!